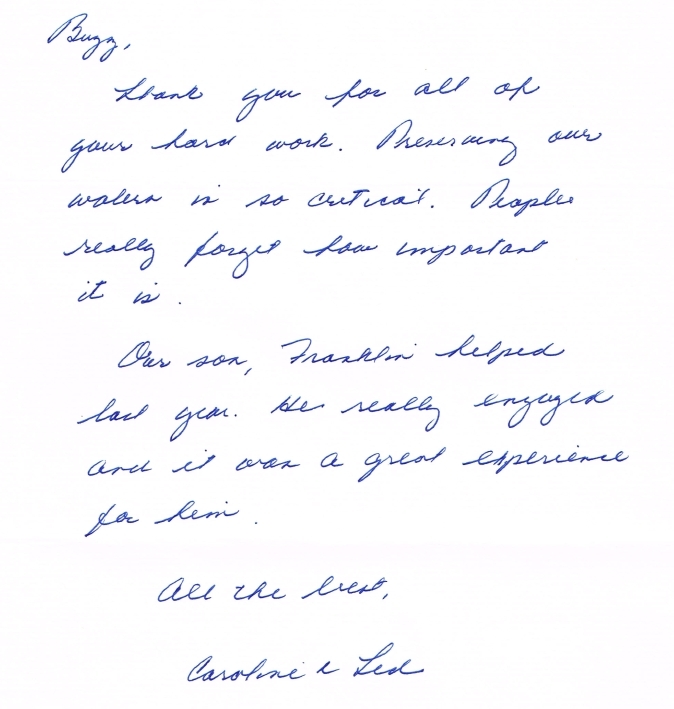 Mike, sending you and your team a note of thanks for the excellent work you have done. Pattie and I drove to Culpeper the other day via Rapidan and the river and riverbanks are pristine. Natural beauty restored! Great work and thanks again. Hello, my name is Michael Klackle. I am a full time student at Germanna Community College. Living in Virginia was very interesting during the past summer. Born and raised on the west coast, I wasn’t familiar with the scenery in Virginia, until I became a StreamSweeper. Being a full time student, I took advantage of my previous summers to work as much as my employers would allow. My days working seemed pointless and I lost motivation before mid-summer came around, so I continued my search for a job that was internally rewarding. I received an email from the green club at my school talking about a summer job opportunity with StreamSweepers, I seized my opportunity. 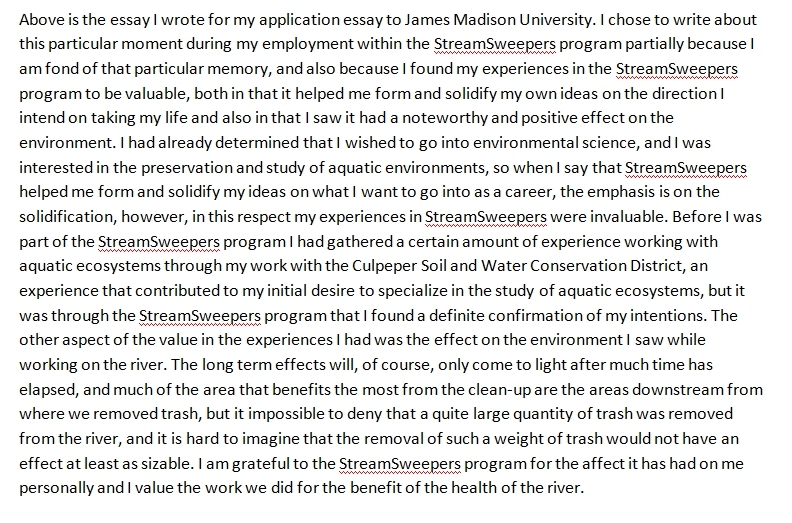 I wanted to work for StreamSweepers because it was a job that allowed me to be outside with nature, I wanted to make an impact. There was a massive difference of what I wanted to get out of the job and what I actually got out of it. 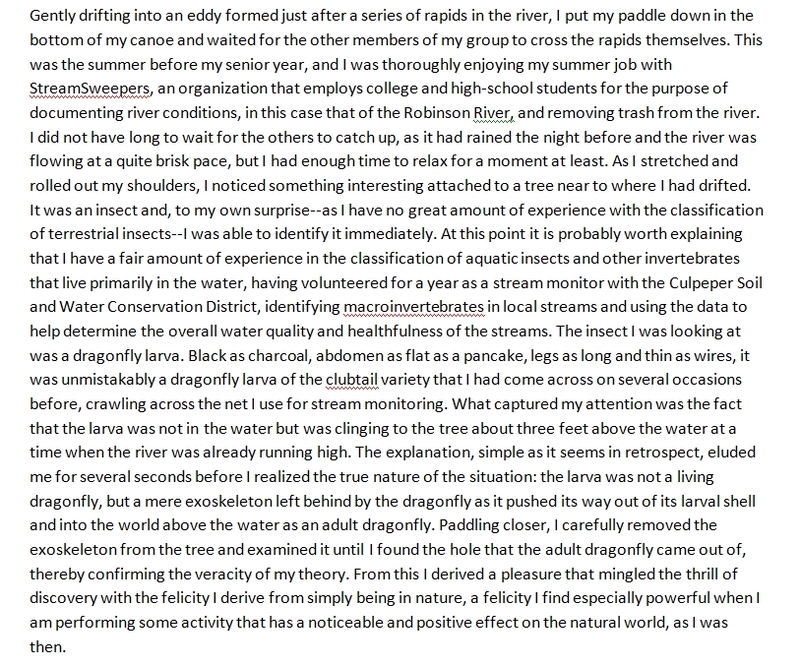 I became more aware of my surroundings, because I know more about ecology through the training I received. I’ve had experiences that made me a better team player as well as a better leader. There were issued and problems that we faced everyday on the job, but working with Mike and Debbie, it was a group effort. I, as well as my input, was respected. 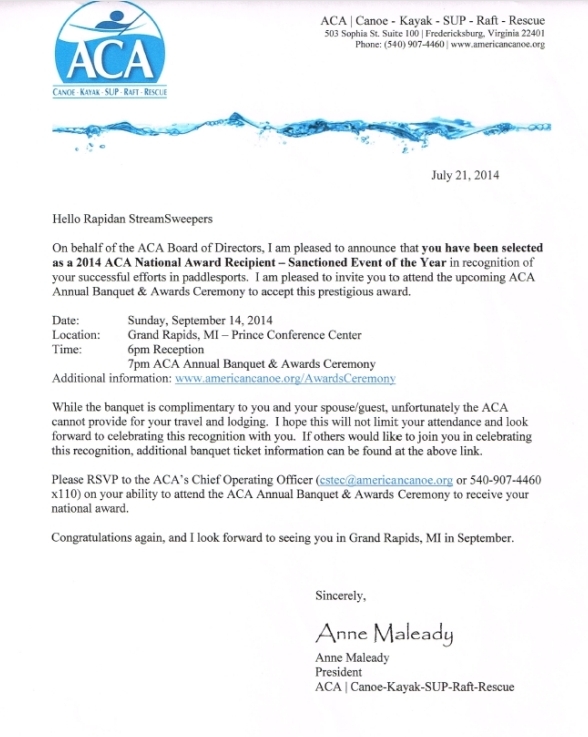 I continue to tell people the fun and exciting adventures while working with StreamSweepers. 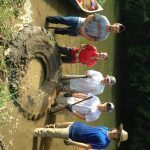 I challenge other students as well as friends about this opportunity that is available during the summer. I want everyone to have the same opportunity as I did. Come hang out with us on the river. 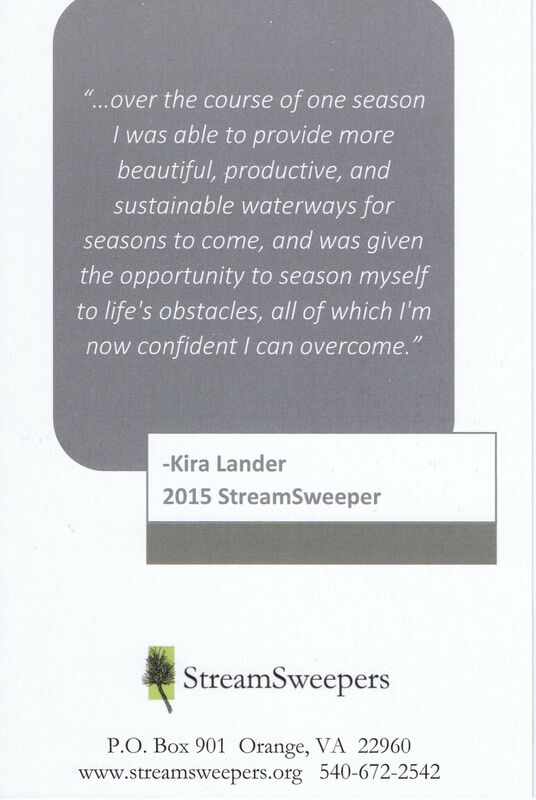 I was very fortunate to be a part of the StreamSweeper 2015 project. I would say, it was the highlight of my summer. I can’t wait for what is to come for StreamSweepers 2016. StreamSweepers has been a big part of my life ever since I joined the team almost two years ago. It’s given me my first real job as well as the experience that comes along with that. It’s also given me friends and memories that I will cherish forever. And while it’s not only been a job for me, it has also been a project that I can support knowing that it serves our local communities in a positive way. 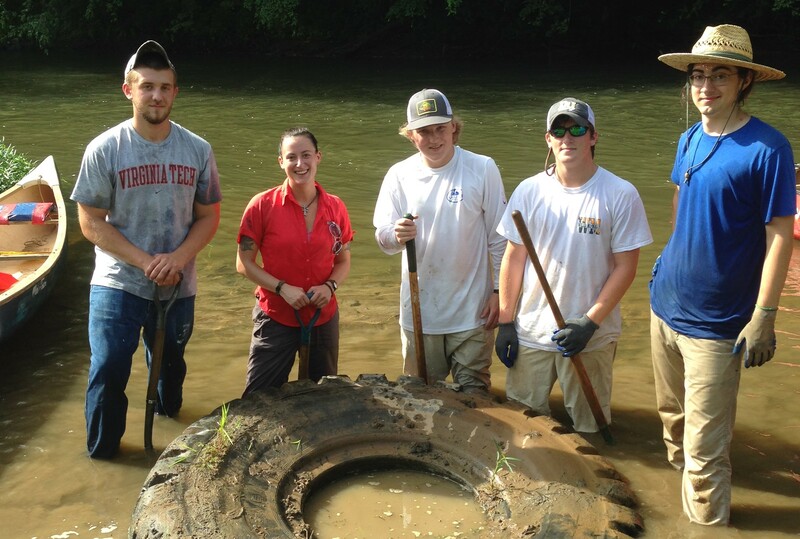 StreamSweepers is a unique kind of program that not offers a helpful service but also works to improve the environment around us and help foster stable and sustainable ecosystems. I can’t emphasize how much the knowledge that the work I was doing with StreamSweepers was helping improve our community has made being a part of the project so fulfilling. 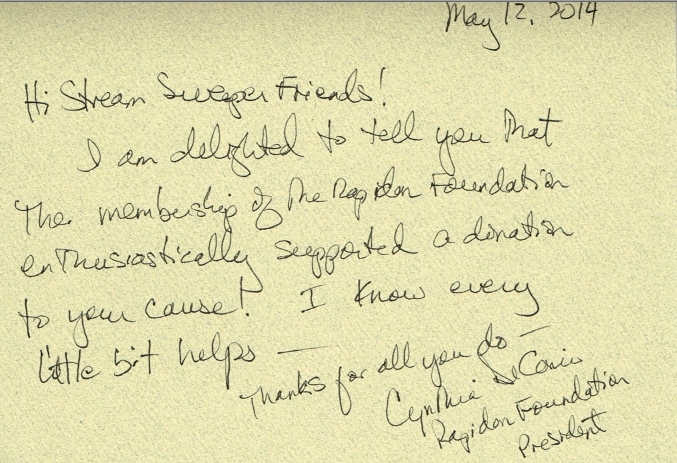 I hope to be a part of this great project and to continue serving the needs of our communities for as long as I can.